With the exception of yesterday gray-on-gray was the color of almost every day!! Will you be off now to warm up your toes? What is the weather like where you repose? On this note...this is not only farewell Mr. January. It is also farewell for a while, Ms. Janet. Taking a blogging break, not forever but just for a while! Will we be water-carriers today or is it our turn to drink? I wish you a wonder-and-joy-full last day of the first month of 2017! Matt, our son, asked me recently if Elvis sang any gospel songs! He sure did!! ...might it be the return of the long-lost sun?! Hearts are full of hallelujahs after gray is crowned with gold! We are like little houses, not? 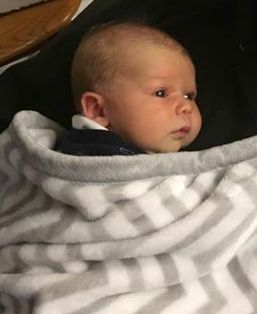 this little guy (our grandson) is almost a month old...already!! Will It Be A Fair-poem Morning?